The bear spread can be considered when the investor expects a moderate fall in the market but is not prepared to pay to take a put outright. The strategy consists of the purchase of a put option and the sale of a put option with a lower strike price. As with the bull spread, the written leg of this strategy serves to reduce the cost of entering the position. However it also caps the profits that can be earned. The maximum profit to be earned is the difference between the strike prices of the two options, less the cost of the spread. 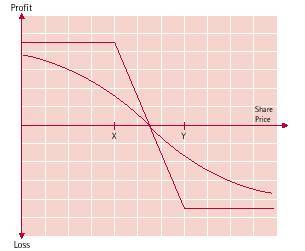 If, at expiry, the share price has fallen to the strike price of the sold option, the maximum profit will be earned. If the stock declines to these levels, the trader may well choose to unwind the spread early, in order to avoid the possibility of exercise on the short leg. The maximum potential loss is the cost of the spread. This will occur if, at expiry, the share price is above the exercise price of the bought option. Limited risk/limited reward: the bear spread costs less to place than the outright purchase of a put option. As a result, the potential for profit is also reduced. 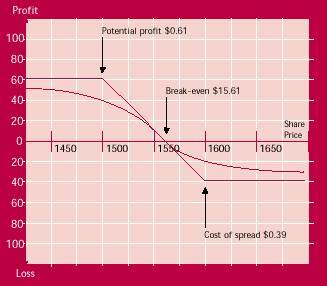 Cost of strategy: the investor must be satisfied that the cost of the spread is justified by the potential reward. Commission costs on entering and exiting can significantly reduce profitability. If the stock unexpectedly falls sharply, it may be advisable to exit the strategy once the lower strike price is reached. Time decay will benefit the spread around the lower strike price, however the trader will usually be more concerned with avoiding exercise on the short leg. If the stock price rises suddenly, the spread may be unwound before the taken put loses too much time value. Use the bear spread when you are expecting a limited fall in the underlying stock. Be sure that the cost of the spread is justified by the potential reward. Do not 'leg in' to this strategy but rather trade both options at the same time. The bear spread can be constructed using calls instead of puts. As with the put spread, the trader buys the higher strike option and sells the lower strike option. The trader may decide to use calls instead of puts in order to take advantage of options that are viewed as overpriced. Since the trader is selling the spread, the receipt of higher premiums is a benefit. There may also be greater liquidity in calls than puts, giving greater flexibility when entering and exiting the spread. The maximum profit available is the value of the premium received. The maximum loss is the difference between the strike prices less the premium received. The bear call spread can be seen as writing a call with protection against an unexpected rise in the market. In this instance, the trader may write a call around the money, and take a call out-of-the-money, which effectively provides a ceiling to the potential loss if the market should rise. The disadvantages of the bear call spread are similar to those of the bull put spread. Since the spread is placed for a credit, there will be margining obligations. Secondly, there is an increased risk of exercise, since the short call has the lower strike price, and is usually written at-the-money.